lo” is supercar produced by the German company “Gumpert Sportwagenmanufaktur GmbH,” whose headquarters are located in Altenburg. The main feature of these cars is unmatched speed. These are racing cars allowed for driving on general-purpose highways. The shield is on the logo of “Gumpert” in the upper part of which there is an inscription “Gumpert” and the remaining space is occupied by a griffin on a red field. The red area of the shield is framed by a light brown border. The designer of cars «Gumpert Apollo» was the founder of the company – Roland Gumpert. Accordingly, the logo was also created by him in the process of developing a general design concept for the first supercar brand. From the automotive industry, the presence of a shield as a logo is a safety for the driver of the car and passengers. Such an emblem for “Gumpert Apollo” is quite suitable, because the developers were not only thinking about high-speed devices but also ensuring maximum and uncompromising security. In addition to all of the above, one entertaining fact should be mentioned. According to myths and legends, the griffon often preferred to choose horses as horses. Perhaps the designers did not even think about such a component of this logo, but such a link is pretty obvious and witty. The symbol of the logo is the griffin standing on its hind legs. This mythical being is the embodiment of strength and unruliness. Few can compete in power and agility with a griffin. The presence of a majestic and formidable bird indicates that cars of the brand “Gumpert Apollo” are created to win. They are created to be the first in everything. Also, it should be mentioned that the griffin is not only graceful but also of natural grace. This can also be said about the car on whose logo it is depicted. The car looks simply awesome and at the same time can boast of excellent maneuverability, both on the race track and on the motorway. 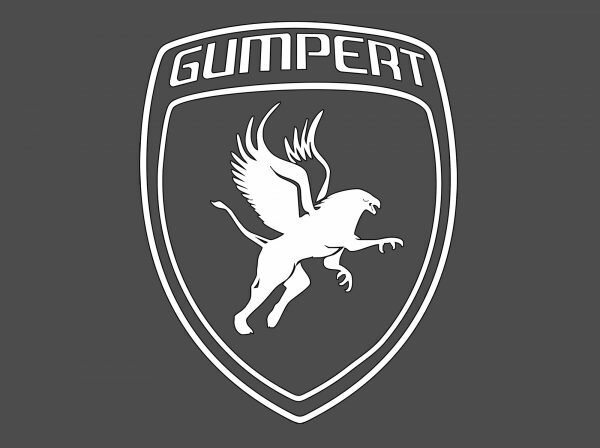 At the top of the logo, there is an inscription “Gumpert” It is written in large Latin letters. It is noteworthy that the inscription is located just above the griffin. Thanks to this, it was possible for the designers to emphasize that all the strength, agility and speed of the griffin are only a part of the cars of this brand. Red – symbolizing the struggle and the desire for new victories. Light brown, as close as possible to orange, which in ancient times was symbolized by gold. He points to power, and the desire to be the first in everything.